As some of you may know from reading here, I’m a fan of the S.T.A.L.K.E.R. series of PC 1st person shooter games. When I first found out about this game, I did a little research on it and found that it was loosely based on a 1972 Sci-Fi novel called Roadside Picnic written by two Russians, brothers Arkady and Boris Strugatsky. It was originally written in Russian, of course. This would have made it a bit difficult for me to read, unfortunately, as I don’t understand Russian at all. Fortunately, in 1977, a translation to English was made by Antonina W. Bouis. About the same time I started playing the game, I searched local bookstores and online sellers for this book, but was never able to find a copy at a reasonable price. I had already checked my local library system, so I knew they didn’t have a copy. Recently though, I was informed about the Inter Library Loan system used by many libraries all over the world that allows books to be borrowed from source libraries other than your local system. I immediately put in a request for this book. A little library in Clewiston, Florida was nice enough to send their copy of the book to my local neighborhood branch, where I recently picked it up. I read this story in about two days. It was a wonderful Sci-Fi story. I was impressed with the imaginative plot. While it’s not that closely related to the storyline of the S.T.A.L.K.E.R. games, you can see where the creators of the game got their inspiration; even certain terms like stalker, artifact, anomaly, and others are common to both the book and the games. … you’ll get a bonus story from the same authors called Tale of the Troika, which is a hilarious Vonnegut-like sci-fi story that satirizes the inane world of bureaucracy; like the old Soviet system, which it is obviously lampooning. Contact your local library about this book or maybe use the Inter Library Loan system like I did. You may even want to purchase a copy for yourself. When I get a couple bucks in my pocket that isn’t needed for food or gas, I’ll be buying a copy of this book to keep in my own personal library. 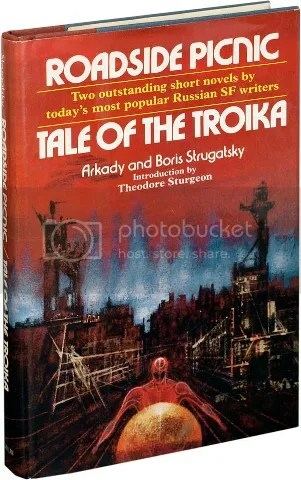 Posted by V. T. Eric Layton on 3 December 2012 in Books and Literature and tagged books, pc games, reading, reviews, Roadside Picnic book, S.T.A.L.K.E.R., science fiction, Strugatsky brothers. Awesome! Love to find the history on books!